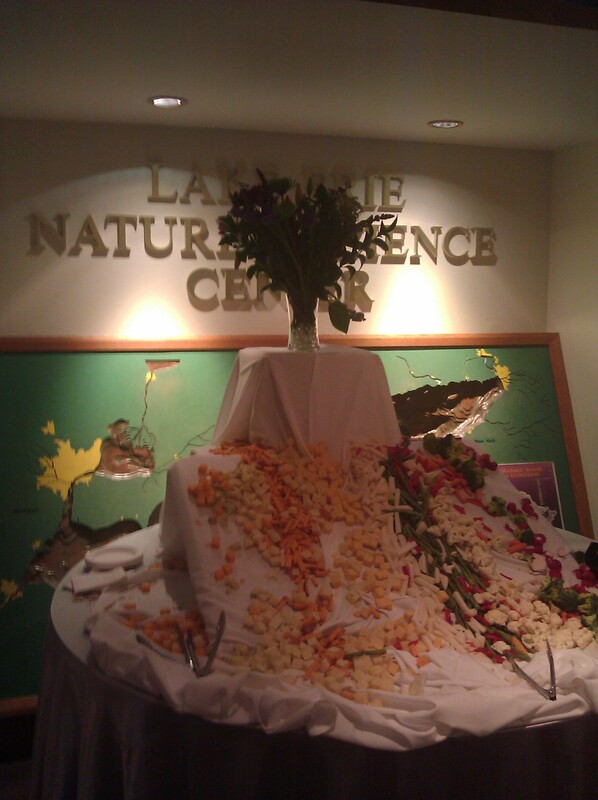 I just got home from the Lake Erie Nature and Science Center‘s annual benefit. This year’s annual benefit featured “a modern twist on a clambake.” Since I love a good clambake I couldn’t wait and bought ticket number 170. Tickets were $75, with $45 tax-deductible. 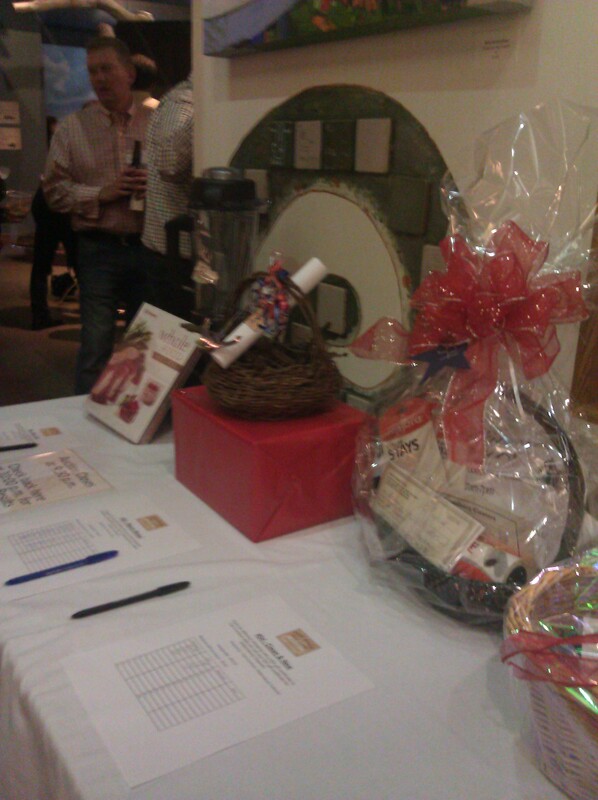 They also had a silent auction and several raffles. The featured raffle was for $1,000 in airfare. I bought raffle tickets for the electric wine cooler stocked with 22 bottles of wine and the $535 in gift certificates and raffle tickets. Unfortunately I didn’t win, but the money all went to a very good cause – the Lake Erie Nature and Science Center in Bay Village. The menu was inspired by traditional clambake favorites, including clam chowder shooters, clams, and corn lollipops along with chicken skewers, carved beef sliders, sweet potato fries, and cupcakes and popcorn for dessert along with a Lake Erie Signature Drink called the Nor’Easter (light rum and ginger beer). We walked in to be greeted by a table overflowing with cheese, crackers, crudités and dip (the first photo was taken at the end of the night, because everyone was crowded around it when we got there). There were also several open bar stations scattered around the Center with beer, wine, soft drinks, and water – and the Nor’Easter was available at the bar station outside near the band. I loved that they had plenty of seating and tables scattered throughout the Center. My friend and I walked around a bit to get the lay of the land and ate our appetizers outside near the bonfire. The first food station we hit featured honey cinnamon butter, cornbread (both sweet and with chorizo), chicken skewers with Thai peanut sauce, corn on the cob lollipops and steamed clams with either a sun dried tomato pesto, a spicy red sauce or drawn butter. Since I am a purist I stuck with the drawn butter and used it on both the clams and the corn. Everything was simply outstanding. The clams were tender and perfectly steamed. I only had one unopened clam. I chose the sweet cornbread and slathered it with the honey cinnamon butter as well as dipped it in some leftover drawn butter. The chicken skewers were tender, and the peanut sauce was nicely seasoned and had just enough heat to be absolutely delicious. The corn on the cob was a little soggy, but I’ve had much, much worse at restaurants. Plus, corn on the cob is hard to serve to a crowd and keep warm. I went back for seconds of the clams and corn. The lines started getting a little longer as the night progressed. The line at the roast beef carving station moved pretty slowly, but the carver was trimming the meat as he was cutting. As he got to me they brought out a fresh roast beef. I asked what the crust was, and the servers couldn’t tell me. It looked like a dry rub crust, but who knows what was in it. In any event, it was delicious. 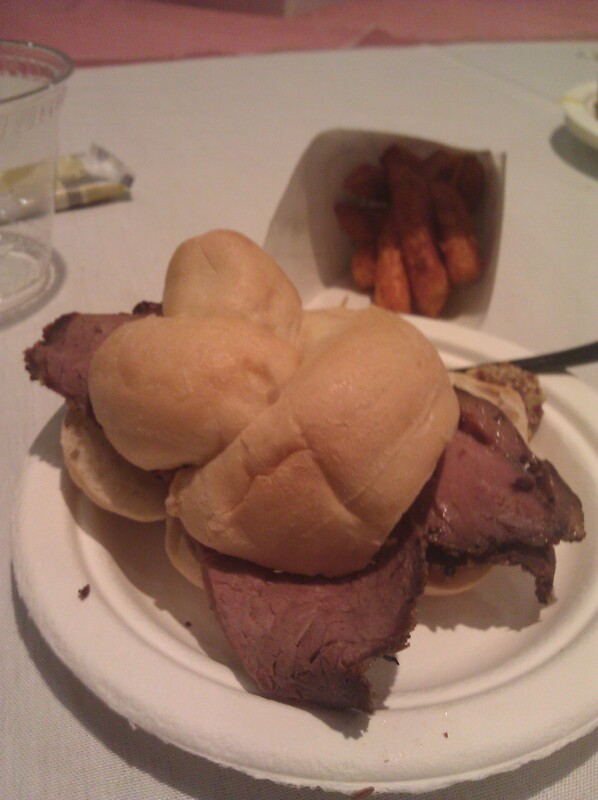 It was served on soft dinner rolls along with horseradish cream and stone ground mustard. They served the most delicious sweet potato fries with them. They must have been dipped in brown sugar and cinnamon before baking, because they had a nice cinnamony sweetness to them. 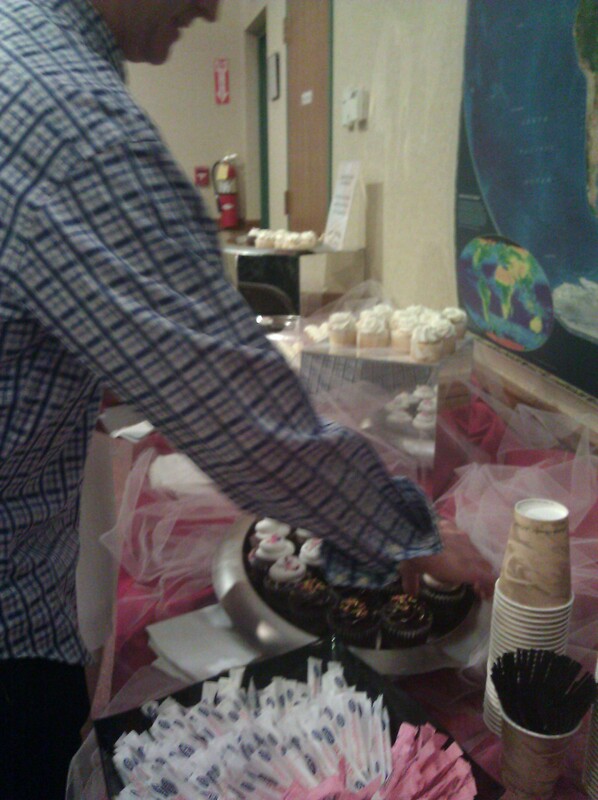 The dessert was served at around 8:30 and they brought out tea, coffee and lots of assorted cupcakes and mini-cupcakes. I chose a mini coconut cupcake and a chocolate cupcake with vanilla buttercream frosting. Both were moist and delicious. At some point we took a break and checked out the silent auction items, which included a clambake, a Vitamix blender and whole foods cookbook, tickets to the Cleveland Orchestra and Journey, an American Girl doll, various events and classes (I was very tempted to bid on tickets to the Metroparks golf courses for my brother-in-law but he lives in Medina…), 4 hours of personal assistant/organization help, and diamond jewelry. I didn’t bid on anything, but my friend did – and won a night at the planetarium for 60 people by rebidding at 9:30 just as the auction was closing. We also got to talk with the Science Center employees and volunteers and pet the skunk, ferret, chinchilla, etc. The carving station was located in the critter corner, so I got to admire the snakes, fish, turtles and other “critters” while waiting in line and walking back to my table. 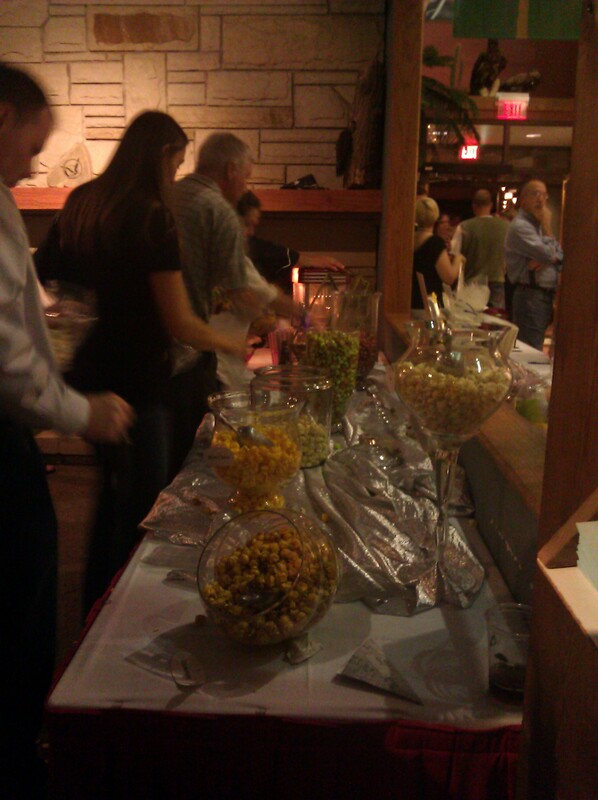 They also had a popcorn station that people could enjoy or bag up to take home. The varieties of popcorn included both savory (dill, ranch and mild cheddar cheese) and sweet (caramel apple, cotton candy, chocolate cherry and banana split). 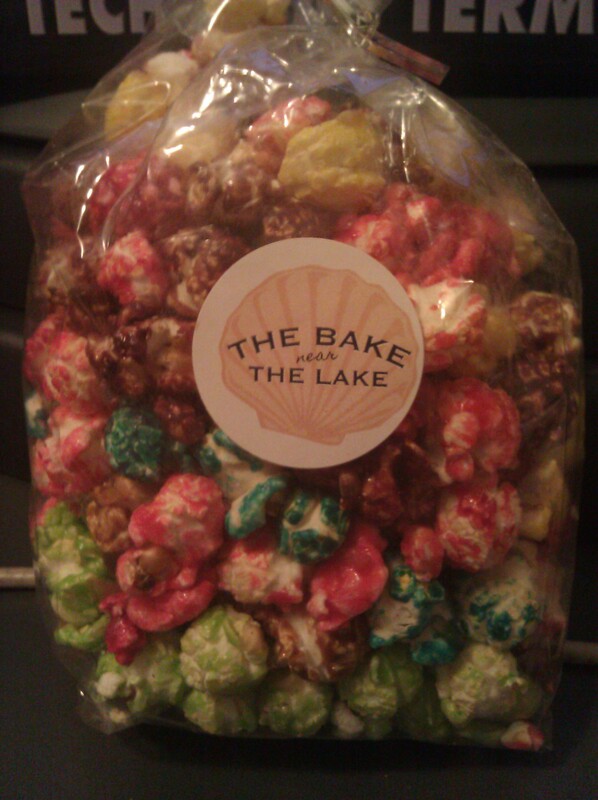 I bagged up some sweet to take home and munched on a handful of ranch popcorn out at the bonfire. I enjoyed singing along with the band (The Feedback) as they played music from the 70s, 80s and 90s. They had a very nice range of songs and voices. Servers walked around with trays of clam chowder shooters (it isn’t a clambake without clam chowder!) and bacon wrapped around blue cheese (the one clunker of the night, but I didn’t realize it was blue cheese until I bit into it and I’m allergic to it). It was perfect clambake weather – in the 60s and slightly cloudy. I enjoyed wearing long pants and a long-sleeved blouse and not sweating to death. We could see the stars just at the edges of the clouds. It started lightly raining just as the event came to an end at 10:30. 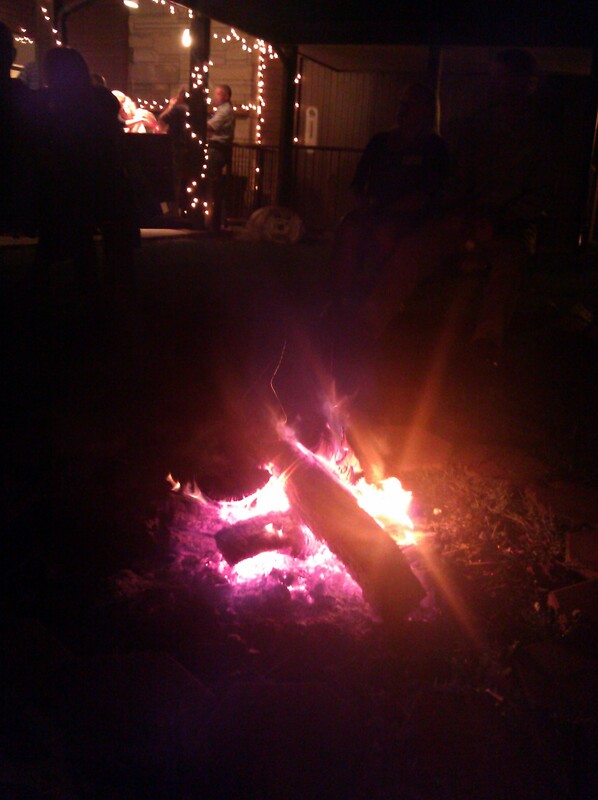 I drove home relaxed and very happy – and smelling like a bonfire. It was the perfect way to say goodbye to the summer here in Cleveland. I was at the Bake Near the Lake and had a fabulous time! 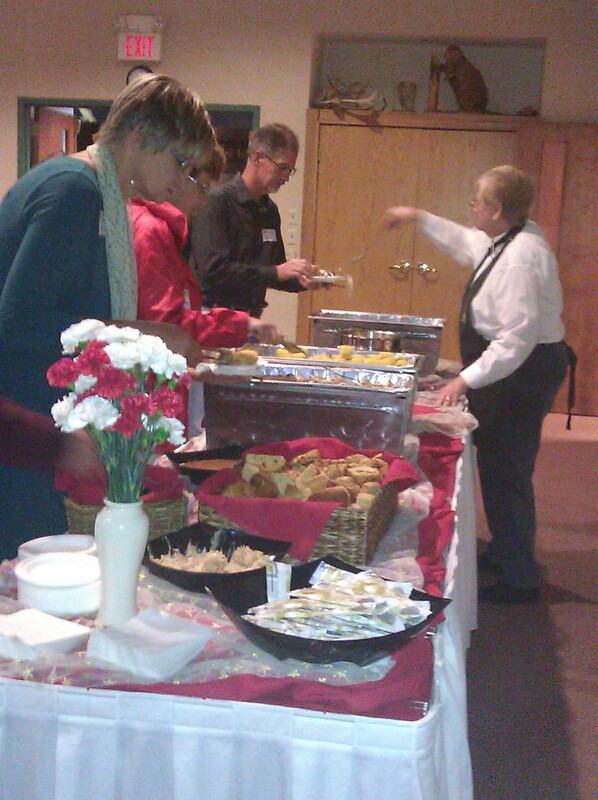 The food and entertainment were incredible! 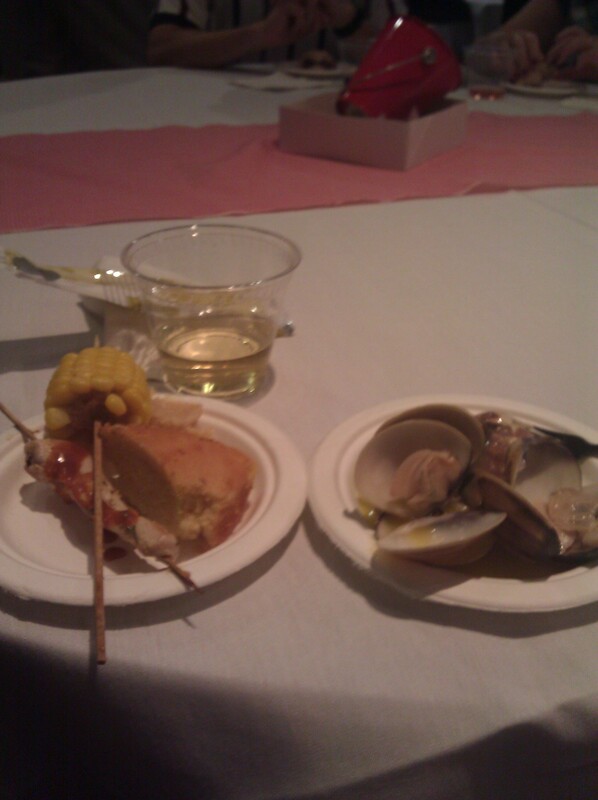 The wonderful clam bake theme was created by Catering By Verba’s. Thought I’d throw that out since it wasn’t mentioned in the blog. Thanks for adding that. They did a great job, and I forgot to mention them by name. I was also there and had a great time! Does anyone know who donated the popcorn? I won the gift cards which made the night that much better!